The birth of the mountain is a violent thing. Whether it is born of flowing lava or rushing tectonics, mountains are forged under fire, pressure, and explosion. From our perspective, we see stability, peace, stalwartness, and continuity. As we stand at either foot or peak, we see stillness. We rarely sense the constant evolution, mutation, and change taking place beneath our feet. But our perspective is barely even the blink of an eye in the scheme of all things. In geological or universal terms, we have not even merited mention in our existence as a race, let alone as an individual; so, how can we, in that moment of perception with the eyes and ears and feet detect the millennia-long process of growth that the mountain experiences, that the mountain perceives. The mountain rushes skyward, and settles down to earth, set skyward and earthbound at once, pulling in two directions and pushing back from both. Tension. Keumgang is such a mountain – the most beautiful mountain in Korea. Keumgangsan was also born of powerful and often harsh movements of a restless earth and reaches upward to the roars of the sky. But all we see are tranquil lagoons, rushing waterfalls whose song invokes within us a sense of peace and stillness, and jagged formations that are the picture of beauty and danger at once. And still, beneath there is tension; there is engagement of the land and magma. There is change. Standing at the base of the mountain is akin to standing before our teachers and mentors, overcome with admiration as we perceive their expertise, their flow, their strength. And yet, there at the base, our eyes, ears, and feet fail to perceive the earth-forming growth taking place within their every move – in their perspective, we are but a blink of an eye, but their time table is different. This is Keumgang as a form. A simple pattern, certainly, in the way that Keumgangsan is simple and our mentor’s movements are simple. Never easy. On the literal surface, the pattern is the kanji for mountain. 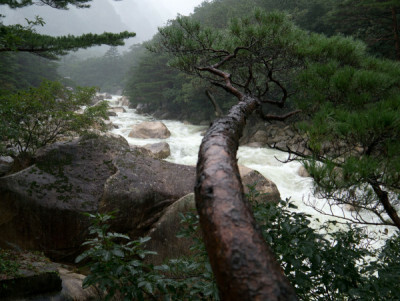 By performing the choreography of this poomse, you are reciting the name of the mountain: Keumgangsan. In its movement, it is telling the story of the mountain’s birth. It begins with the tension of tectonic plates, pushing and forcing each other together, one pushing over, the other reluctantly and willingly giving way and finding a new path beneath, building pressure. There is a sudden explosion upward; the lower plate snagging the upper and suddenly releasing a mass of earth upward toward the heavens. Gravity takes over, settling the risen earth, creating its foundation. The budding new mountain needs to reach and grow. It shifts and moves and settles and creates. Once enough tension builds, it once again explodes upwards, reaching toward the sky, ever higher, settling back down toward the earth taller than before, different, larger, stronger, more vast and expansive with more experience and desiring of further growth, taller heights, and higher reach. In the eyes of the mountain, this process is endless and everlasting, repeating over and over, and, upon reaching a new level, finding only that there are higher peaks to reach and broader, deeper foundations to build. For the mountain, this is a life-long path. In the eyes of the Earth, she pushes her child forth toward the sky and only sees him soar. In the eyes of the sky, the mountain simply appears in an instant. Like magic; there it is. Perspective. So, too, with our mentors; Keumgang, the poomse, is also a metaphor for their growth. We see their prowess and they see the work it takes to maintain and grow. Keumgang is the story of the lay man looking through the window at the martial artist practicing on the tatami. The man outside the window sees a Master inside the dojo. The man on the tatami sees barely a beginner on the mat. Keumgang is barely the beginning.